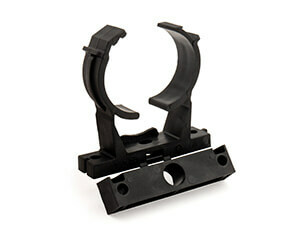 Unsure about how far apart or close together you should space your pipe clips? Watch our YouTube video for advice! 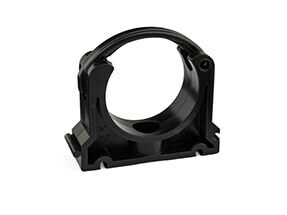 The main difference between our pipe clips is that some are plastic and some are rubber-lined steel. When deciding between the different pipe clips, one of the main factors to consider is the potential expansion and contraction of your pipe system. Long systems of pipe, if gripped hard by a pipe clip, will bow in the middle during expansion and will pull on itself during constriction, putting stress on the system either way. Plastic pipe clips allow the pipe to move around somewhat when they grip it, thereby allowing for any expansion and contraction in long pipe systems. Rubber-lined steel pipe clips, however, grip the pipe hard, and so are not ideal for long systems, but are better in shorter, more complex ones. The second factor to consider is the height of the pipe clip - the height refers to the distance between the bottom of the hole for the pipe to go through, down to the bottom of the base of the clip itself. Plastic pipe clips are fine for holding pipe, but if you want to introduce a valve or union for example, these parts will be deeper than the pipe clip and therefore won't fit on your system. To combat this, you can buy separate spacer blocks for these clips which would raise them up and create room for other fittings and valves, or you can buy pipe clips with inbuilt spacer blocks for the same purpose. These inbuilt spacer blocks are capable of being removed if not required. They do not allow space for flanges. 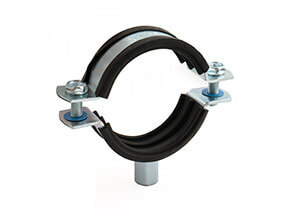 The rubber-lined steel pipe clips have threaded rods which attach onto the clips and allow the height to be adjusted. The rods are sold in pre-cut lengths and also in the full 1m length. They can either go into union-struck fittings or into threaded feet which can then be screwed onto a backboard, or timber, or steel, or multiple other materials. These threaded rods allow for a lot of flexibility when you are clipping your system.